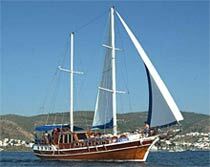 M/S Halikarnaslim is a Bodrum built wooden Yacht with classic lines and a so called "mirror-aft", which gives this type of a Gulet more all-over room and plenty of deck space. There are comfortable cabins, a shaded aft, lounging area e. This Gulet is ideal for those who wish to combine comfort with the added pleasure of sailing. 5 cabins for 10 guests with portholes, wardrobe, drawer, mirror; All cabins with ensuite shower and "hometype" flush toilet. Provisioning: Full-Board including Breakfast, Lunch, 5 o`clock Tee or Coffee, Dinner will be provided for 28,- Euro per Person / per day. Half-Board including Breakfast, Lunch, 5 o`clock Tee or Coffee will be provided for 20 Euro per Person / per day. Equipment: Complete navigation equipments, Mobile Phone, 12 V, Life Raft, Life Jackets, Fire Extinguishers, Fully equipped Galley, Deep Freezer, Ice Boxes. Cabins : 5 double berth spacious and comfortable cabins. Seperate captains cabin. All cabins with ensuite shower and "hometype" toilet. All cabins with portholes, wardrobe, drawer, mirror. Complete navigation equipments, Mobile Phone, 12 V, Life Raft, Life Jackets, Fire Extinguishers, Fully equipped Galley, Deep Freezer, Ice Boxes.